SERVPRO Richardson specializes in water damage restoration in Dallas Fort Worth. We've restored thousands of properties since 1986. SERVPRO Richardson is a trusted leader in Texas disaster restoration. We are an expert mold removal company in Dallas, TX, and we have helped restore thousands of homes and businesses in our hometown for over 30 years. We know how to properly clean and restore all properties, and we have performed residential and commercial restoration in Dallas, Fort Worth, Lewisville, Garland, McKinney, Waxahachie, and Plano, TX. Our SERVPRO in Dallas franchise also has a Texas Mold Remediation Contractor License. We offer free mold inspections in Dallas and all North Texas. Besides residential services, we also offer commercial mold remediation. You can trust us to handle all your residential and commercial restoration and cleaning service needs. We're a locally owned and operated business. Learn more about us. SERVPRO Richardson is a leader in Texas disaster restoration. We've restored thousands of properties since 1986. When there is water damage in DFW, we are ready to respond 24 hours a day. The last place that we like hearing about having water damage is a hospital. When we received a call about a flooded hospital with an emergency water damage in Dallas, we knew we needed to work as fast as possible. Hospitals cannot be shut down. When they have an emergency, we’ll help them no matter what time of day it is. For this hospital, their water damage happened in the middle of the night. Within 30 minutes of their phone call, a team of our Dallas restoration managers were on site inspecting the water damage. Minutes later, our water remediation technicians arrived and began to execute the managers' water damage restoration plan. The water damage this hospital experienced happened across a portion of two different floors. When a pipe burst on the upper floor, it flooded the hallways and rooms. The water also found its way down to the floor directly underneath it by escaping through the ceiling. Our restoration managers were you able to find exactly where the water traveled to by using thermal imaging cameras. After our technicians extracted all of the water from the flooring, walls, and ceiling, it was time to set up a drying plan. We needed a drying plan that achieved our goal to open the hospital rooms for patient care as quickly as possible. There are three different water classifications and categories that we use in the restoration industry. Classifying water helps us determine the safest way to handle the damage. For this hospital, we were lucky to find that the water was Category 1 which meant it was clean. Clean water can be removed quickly because the areas do not have to be sanitized. Learn more about water classification by reading our article Classification of Water and Water Category. It took just a few hours for our technicians to extract all of the water from the flooded hospital floors. Although the water was Category 1, our technicians still sanitized every area the water touched due to the nature of this environment needing to be as sanitary as possible. It's never enough to apply a sanitizer onto an area and hope that it does its job correctly. Chemicals need a specific dwell time to work effectively. It’s important for us to know that the job was done properly, especially in an environment where patient safety is the main concern. Our office uses TPA testing to make sure that our sanitation efforts have worked. TPA stands for adenosine triphosphate. We test TPA levels on surfaces to scientifically validate the results of our cleaning. Our cleaning technicians tested all the areas that we sanitized by using TPA reader. Any areas that scored higher than a zero for TPA were immediately cleaned again. It was only when areas tested zero that anyone was allowed back into that area. A zero score on a TPA test means it is food-grade safe. This means that the area is clean enough to eat from without the risk of biological hazard. When we are drying a structure after water damage, we make sure everything is dried properly. A correctly dried structure helps avoid mold and permanent damage. In a small water damage, a few professional dehumidifiers is usually enough to correctly dry the structure. In a large loss like this hopsital, the use of a commercial desiccant is needed. A desiccant is a very large and specialized dehumidifier that is a specially made for large areas. Our office temporarily installed a desiccant to dry the structure’s vast air space. When the water damage occurred, a significant amount of water found its way into one of the hospitals records room. In a matter of just minutes, thousands of patient files were wet. Due to the sensitive nature of these files and healthcare privacy laws, this paperwork needed to be saved. There are many water restoration companies in DFW, but few have the capability to save damaged paperwork. We knew from other water damages in schools and libraries how to respond to the hospital’s need to salvage important paperwork. We also knew we had to act quickly to save the paperwork’s integrity. Before the paper is permanently damaged we brought a refrigerated truck and loaded sealed boxes of sensitive paperwork into it. Inside the truck, the boxes of papers were quickly frozen. Once the truck was loaded, it immediately left to the SERVPRO sublimation chamber where the documents underwent restoration services. The SERVPRO sublimation chamber is state-of-the-art equipment created to save water-damaged paperwork. The first step is to freeze the paperwork as quickly as possible. The freezing stops the paper from falling apart. The paperwork needs to stay frozen until the sublimation process can begin. This is why we immediately freeze paperwork and keep it a frozen state as it travels to our chamber. Sublimation is the process where water goes from a frozen state directly to air. Usually, the stages of water mean that it will go from frozen to liquid to air. Sublimation skips the liquid part which makes it possible for water damaged paper to be saved. The paper goes directly from a frozen state to dry. Sublimation is a very sophisticated process that very few disaster restoration companies in the nation can accomplish. With the use of the SERVPRO sublimation chamber, this hospital was able to save all its patient paperwork. After the sublimation was done, the documentation was once again loaded onto a truck and delivered back to the hospital. Our office administrators were able to contact the hospital's insurance company within just a few minutes of their water damage happening. We were able to establish the hospital’s claim and get their entire project approved within a few hours. There are many water removal companies in DFW. Our franchise has over 30 years of water restoration in Dallas. We’ve restored thousands of properties, and we work with all insurance companies to handle commercial water removal in Dallas Fort Worth. Trust us to help you. When properties need water damage repair in Dallas, we’re their first call. Our franchise has the expertise to work with insurance adjusters and make sure that water damage claims are processed correctly and quickly. We are one of the few full-service water damage repair companies available. We can help from start to end -- from emergency water removal to construction. If any commercial mold remediation is needed, we’re licensed for that, too. SERVPRO of Richardson is a trusted fire and water damage restoration company in Dallas, TX. We have the expertise and experience to properly restore all properties needing water mitigation in Dallas Fort Worth. We have performed residential and commercial restoration in Dallas, Fort Worth, Lewisville, Garland, McKinney, Waxahachie, and Plano, TX. Our SERVPRO in Dallas franchise also has a Texas Mold Remediation Contractor License. We offer free mold inspections in Dallas and all North Texas. You can trust us to handle all your residential and commercial restoration and cleaning service needs. SERVPRO Richardson specializes in commercial mold cleanup in Dallas Fort Worth. Commercial properties usually have a lot more space than the average property to grow mold. The size of a commercial property alone makes mold remediation inspection an important undertaking. When mold is found in a commercial property, it should be remediated as quickly as possible to prevent the issue from growing. Our franchise is a licensed Texas Mold Remediation Contractor, and we have helped many businesses and commercial property owners properly remediate the mold on their properties. To prevent mold from becoming an issue, we recommend inspecting your property for mold at least once a quarter. These are the most likely places for mold growth in a commercial property. Bathrooms are a good place to look because there are so many places that water flows through them. Look behind sinks, especially if they are in close to the cabinet, and behind and around every toilet. If you see any pipes leaking, call a plumber and get it taken care of immediately. Many businesses have small kitchens for their staff to use. If you have a kitchen area, look for leaks wherever the sink is and around any cabinetry. If you have a refrigerator or ice maker in this area, also inspect the area surrounding it. Make sure to also look inside all of your cabinets. There may be pipes running water behind the walls, and if there is a small leak behind it, you may not notice it until you see water spots on the drywall or cabinet. Many industrial settings have multiple sinks around their property. Look for leaks around every sink you have on your property. Break areas are popular places for mold growth due to spills and leaking vending machines. Look behind vending machines and see if there is excessive moisture behind it. If the machine is not operating correctly, there may be too much condensation that can then turn into a source of mold growth. While not all commercial properties have water fountains, they are still widely used in public buildings such as schools and libraries. Look for mold growth around every water fountain in your facility. Make sure to have absorbent mats to absorb any spilled water around these areas. These mats should be cleaned and left to completely dry on a daily basis.n If you see the floor loosening or becoming a different color around your water fountain, this is a sign that water is being allowed to absorb into the floor. Look for water leaking from the ice maker on a regular basis. Just like ice makers, freezers are common in many commercial properties, especially industrial kitchens. Look for leaking water around your freezer. The smell of must means mold is likely already growing. There tends to be some water spillage every day in a laundry area, and this water should be cleaned up quickly. Another aspect to look out for is a leak from the many pipes that carry water. If your laundry machines are close to the wall, make the effort to look behind them on a regular basis to ensure that there is no mold growth or moisture. Some industrial properties have showers, but they are mostly placed in areas like gyms or places that host sporting activities. Communal gyms are a very popular place for mold because moisture is almost constantly introduced into the area. Showers also tend to not be regularly cleaned. If you are charged with the upkeep of a shower, make sure that there is a way to remove the moisture from the air as it's introduced into the environment. Windows that are not sealed properly let precipitation into a building after a storm or even on a regular morning with dew in the air. A convenient time to check for moisture is after a storm. Look at your windows and ensure that no water has been able to break the moisture barrier. If you see any water, repair the moisture barrier quickly. Doors have the same situation that windows do in case of storms. Check your moisture barriers around your doors, especially on the bottom, to make sure that water stays out. Because loading areas have a lot of interaction with the outdoors and typically have vehicles coming in and out, it's important to make sure that these areas remain dry. Not only is this a matter of personnel safety, but the water that is allowed to stay indoors will eventually become a problem. Previous sites of water damage are also places where we ask to inspect when we are looking for mold. The reason for this is that those places have seen higher-than-average moisture content for a period of time. If the water damage remediation in that area was not done correctly, moisture was left behind and likely caused mold growth. We recommend only hiring reputable water damage restoration companies to handle your water damage. Always ask to see the drying logs from the company you have hired to make sure that they dried your property correctly. The areas around AC units are usually places with problems. If your unit is placed on the roof of your commercial building, make sure that the unit is inspected and working properly so no water pooling occurs. If you also notice moisture in your HVAC system, this is a sign that there is likely something blocking the air duct. In this case, we recommend you schedule an air duct cleaning. Water heaters tend to be enclosed in dark spaces, which create a perfect environment for mold. If your water heater is enclosed, make sure to expect it regularly to see if any water is leaking. If you see any leak, no matter how small, make sure it’s taken care of. Many water damages in DFW are caused by water heater failure. In a matter of just a few hours, entire homes have been flooded. Be sure to upkeep with your water heater maintenance. If you do have a water heater leak and need water cleanup in Dallas Fort Worth, we are available 24 hours a day. If you are interested in a professional mold inspection, give us a call anytime. We are happy to visit your property and inspect it for mold growth. Mold inspections and estimates are always free and available to all businesses in North Texas. Give us a call today. If you find mold during one of your routine inspections or we find mold during our inspection, we can help. We have helped restore thousands of properties since we began servicing Dallas-Fort Worth in 1986. We are a licensed contractor for the state of Texas, and we have the experience you need remediate your mold quickly safely and legally. Unfortunately, many commercial properties only find mold when it has grown past the 25 contiguous feet the state of Texas allows before it becomes mandatory for the mold remediation to be filed with the state. We understand that businesses interruption is expensive, and any mold remediation project that occurs on your property has to happen quickly and correctly. We routinely work with other businesses to remediate their mold problems after hours. This either minimizes business disruption or eliminates it completely. Give us a call to talk about how we can best serve your business to keep your employees safe and your business disruption at a minimum. To learn more about the mold remediation process please read our article here. There are many mold removal companies in Dallas to choose from. Many of them are specialized and cannot also offer water damage cleanup services even though they are usually the cause of mold growth. 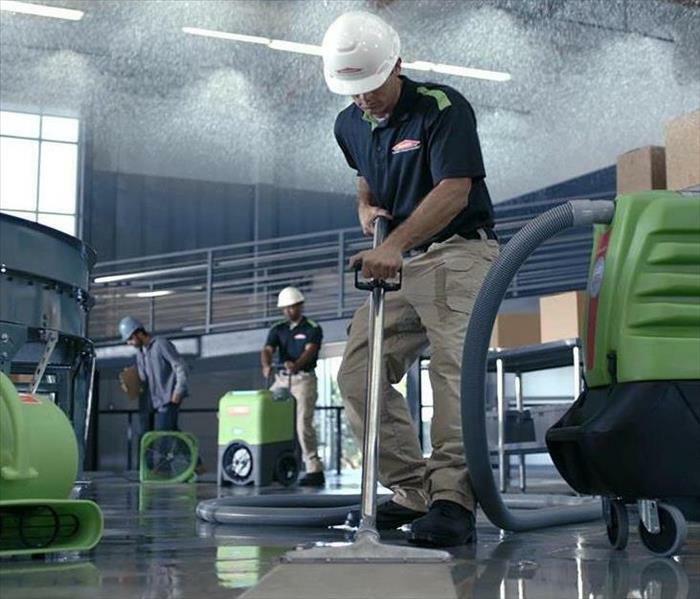 We are proud to be one of the SERVPRO Dallas franchises that offer both in-house mold remediation and water damage repair in Dallas Fort Worth. Our ability to be a full-service mold remediation company is what makes us a leader in Dallas restoration. Black mold remediation requires the same process of any other kind of mold remediation. 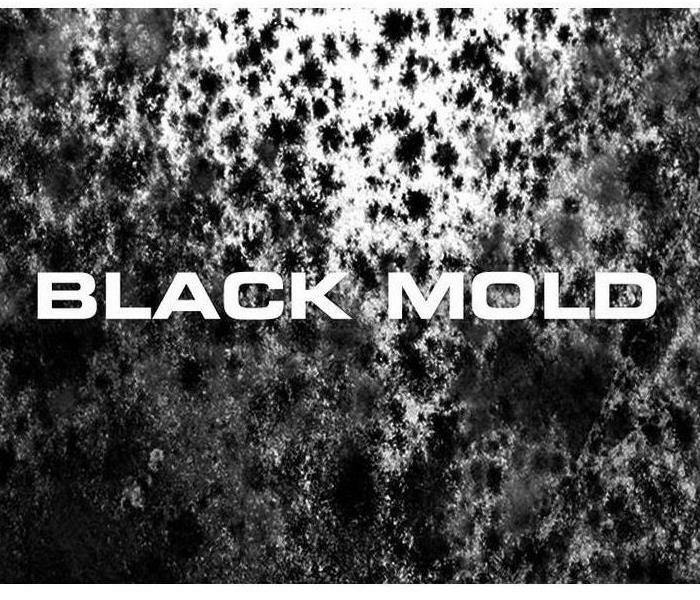 We often receive calls about black mold in Dallas Fort Worth. It’s understandable why black mold is a major concern. There have been many news articles talking about the toxicity of black mold like stachybotrys chartarum. There are many types of mold. Rest assured that our franchise is a licensed Texas Mold Remediation contractor, and we have experience removing black mold from all properties. SERVPRO Richardson is a trusted leader in mold removal and water mitigation in Dallas. We are an expert water restoration company, and we have helped clean up homes and businesses in our hometown for over 30 years. We know how to properly clean and restore all properties, and we have performed residential services and commercial restoration in Dallas, Fort Worth, Lewisville, Ennis, Garland, McKinney, Waxahachie, and Plano, TX. We have a Texas Mold Remediation Contractor License and offer free mold inspections in Dallas and all DFW. If your property requires mold clean up in Dallas Fort Worth, give us a call. You can trust us to handle all your residential and commercial restoration and cleaning services. SERVPRO Richardson is a trusted leader in fire damage restoration in Dallas, TX. We have serviced Dallas Fort Worth since 1986. When a Dallas apartment fire happens, many units are usually affected. While the apartment that originally caught fire will have the most fire damage, surrounding apartments will also need clean up. For example, the apartments on either side of the originally affected apartment will usually have damaged adjoining walls. They will also have significant smoke damage. Other surrounding apartments, even if they are three or four units away, may also need smoke damage restoration. Some apartments fire are bad enough to affect the roof of multiple units. SERVPRO of Richardson regularly responds to Fort Worth and Dallas fire damage in apartment complexes. We’ve handled every size of fire damage from a small, smoke only stove fire, to a large fire that started and spread to dozens of units. When you sign your lease agreement, you may or may not have to get renter’s insurance. Renter's insurance isn't legally mandatory, but some apartment complexes still require you to get it in case of an emergency. If there is fire damage in your apartment complex, your renter's insurance can cover the cost of fire damage cleanup for everything inside of your unit. Our franchise is a leader in Dallas restoration. We have worked with many insurance companies to handle renter's insurance claims during disaster restoration situations. You will be assigned an administrator from our office who will be tasked with working with your insurance adjuster to make sure that your claim is handled appropriately. Because the apartment complex usually takes care of the unit itself, you as a renter will usually only be concerned with cleaning the smoke damage from your contents and clothing. As soon as you realize there is fire damage to your apartment unit, give us a call. We are available 24 hours a day, every day of the year. Your apartment complex nor your insurance company can tell you which fire damage restoration company to use. It is solely your choice. By law, no one can tell you who to use or punish you if you choose a different company other than the one they might recommend. When you call us, we will go to your unit and inspect the type of fire damage your contents have sustained. We will create an inventory of every item in your apartment and report it to your insurance company as either salvageable or unsalvageable. We will also let your insurance adjuster what fire damage restoration services you need. Salvageable items are those that can be cleaned and completely restored back to how they were before the fire. These items are packed up and taken to our cleaning facilities where they are sanitized and deodorized of all smoke particles. The items are then either stored until your apartment has been cleaned and you move back in, or they can be moved to wherever you are living. Unsalvageable items are those that have been destroyed by the fire. They cannot be cleaned and saved. With these items, we take inventory and report them to your insurance company. Your insurance adjuster will receive a list of all of the items that were permanently damaged in the fire along with a suggested price for a replacement. Ultimately, it is up to your insurance adjuster to decide how to replace these items for you. Sometimes items may be burnt beyond recognition and may not be replaced as it is impossible to tell what they once were. For this reason, we strongly recommend you have a home inventory of your items before any disaster occurs. A home inventory will provide proof of your items to your insurance adjuster. It's understandable that one of the first things that someone needs after fire damage is clothing. Regular washing machines do not take the fire smoke odor out of clothes. In fact, some clothing can be permanently damaged when they are put into a regular washing machine after a fire smoke damage. It's best to trust professional textile cleaners to wash your fire and smoke damaged clothes. One of the first things that our office will do when we arrive is pack up your entire wardrobe. In a matter of fewer than two days, we can wash and remove fire smoke odor from 100 pounds of your clothing and return it to you immediately. We know you need a wardrobe to live from while the rest of your unit is being restored, and we are dedicated to providing you with one. We are one of the few Texas disaster restoration businesses that are certified by the Esporta Wash System. This makes us uniquely qualified to sanitize and remove smoke odor from all types of clothing and textiles, including blankets, shoes, stuffed animals, and much else. It's important to understand that taking fire smoke and soot affected items to a traditional dry cleaner may not get your items clean. Our Esporta Wash System uses natural detergents to clean your items with water using the science behind hydraulic pressure. The result is a sanitized item with a near neutral pH that is safe and comfortable to wear again. Our office has one of the highest rates of clothing fire smoke odor restoration with over 85% success rate. To learn more about our cleaning process, please read our article. In order for the apartment unit to be cleaned, everything that is inside of it usually has to be taken out. All of your items will be packed and moved to our cleaning facility where they will have all smoke and soot cleaned away and deodorized. Your items can either be stored in our long-term storage facility or they can be dropped off at your new living quarters. SERVPRO Richardson has its own storage for our customers. We have the capability to store items of all sizes for a short-term or long-term period. What our customers need items back, we simply move them to their new living location. Business disruption is extremely expensive, and we understand that you need to get your apartment units cleaned and running again. Our goal is to make sure that all of your units are clean and safe again for your renters so they can move back in. While your renters will each have their own and renter’s insurance company handling their portion of their claims, we will also work with you and your insurance company to make sure that your claim is approved and all of your units are clean and reconstructed as soon as possible. We work with all insurance companies and adjusters. We have processed thousands of insurance claims over our 30 years of experience, and we know exactly how to process apartment complex fire damages. As soon as you call your insurance company and get your claim number, give our office a call so that our administrators can get in contact with your insurance adjuster to start processing your claim immediately. By law, your insurance company cannot tell you which fire damage restoration company to use. It is your choice. 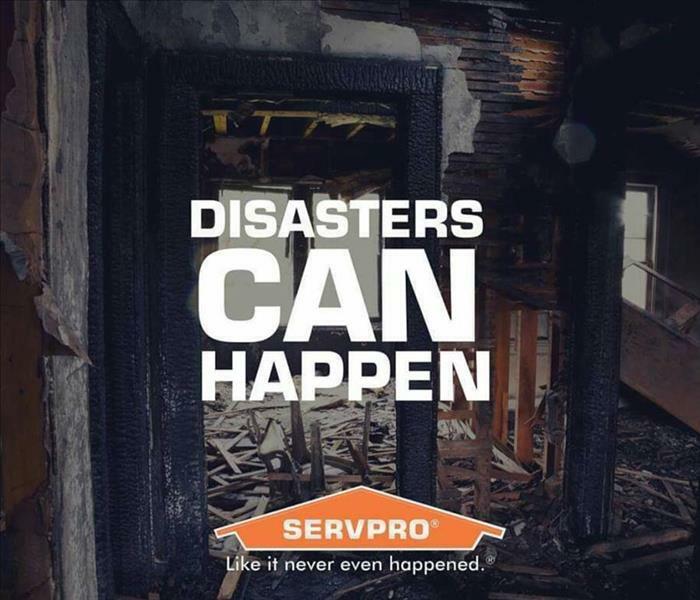 When you choose to work with SERVPRO Richardson as your fire damage restoration company, trust that you have one of the most experienced and trusted leaders and fire damage restoration working for you. One of the first things that you are responsible for as an apartment complex owner is to install temporary protective measures to prevent secondary damage. Emergency fire damage services such as roof tarping and board-ups are exactly this. Secondary damage is any damage that happens after the fire that could have been prevented if emergency measures were taken. If your insurance company finds that you did not take proper care of your property after fire damage, it has the ability to deny your claim. This is why emergency services are so important after fire damage. When a roof is damaged during a fire, it has to be covered with weatherproof tarping. Our technicians will install the temporary tarp to make sure that precipitation does not enter the unit and cause secondary damage such as water damage or mold growth. After the temporary roof tarping is installed, we will take roof measurements and turn in an estimate to your insurance company so that we can have a permanent roof replacement. Just like emergency roof tarping, fire damage will also likely need emergency board up services. This is when we install boards on damaged doors, windows, and outer walls. This is important to prevent weather from coming inside of the building and causing secondary damage. It also tells possible thieves that the property is being taken care of. It's an unfortunate fact that theft often occurs when a fire damaged property is not boarded up. If weather conditions prevent us from safely boarding up or tarping your apartment complex, we will hire a live security guard to stand watch for 24 hours a day until our technicians can safely work. It is very likely that your renters' contents will all have to be removed from the unit for us to be able to properly clean it. We will work with your renter directly and their renter's insurance company to pay for the moving and cleaning of their items to our cleaning facility. Even though your renters may all have different renters insurance companies, our office will handle all of them individually. We will remove the contents from all apartments as fast as possible so that we can get the cleanup of your units started quickly. There are different types of smoke and soot depending on what items were burned during the fire. Every type of smoke needs a different type of cleaning method. 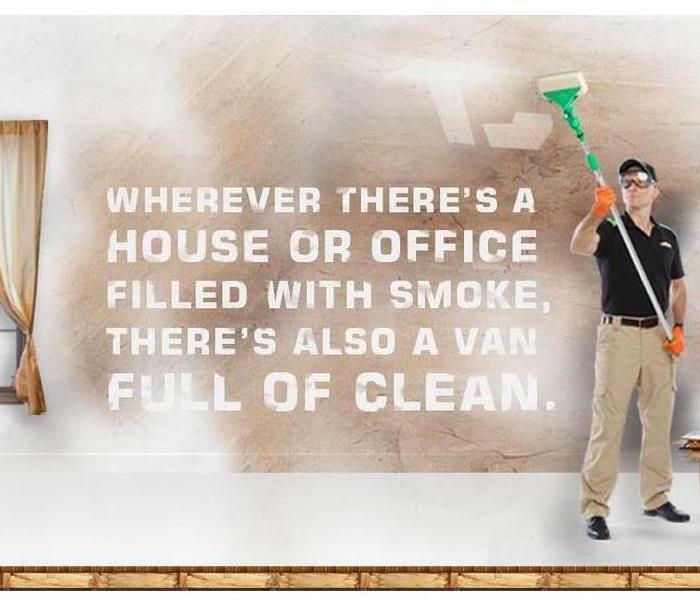 Our technicians are experienced and will identify the type of smoke and clean it properly. If the apartment units have carpeting, we will perform carpet restoration services at this time as well. If any part of the unit is permanently damaged, our technicians will demolition that portion of the unit and prepare it for reconstruction. Smoke damage restoration is necessary. You know your apartment is cleaned of all smoke and soot when you were able to walk in and not recognize that there was ever a fire inside. Fire smoke odor removal and deodorization after fire damage are important, and the most important reason is the health of the occupant. Our office uses HEPA vacuum filtration to make sure that all smoke particles are removed from the air. Along with fire damage cleanup, we may also use other deodorant removal techniques such as fogging and ozone to ensure that all fire smoke odor is removed. Once the apartment unit has been thoroughly cleaned and deodorized, it is time for the apartment to be put back together. Any part of the unit that was permanently burned will now be replaced by a reconstruction team. The result is an apartment that looked the same as it was before the fire occurred. SERVPRO of Richardson is a trusted leader in the fire damage Dallas industry. We are based out of Dallas, TX, and we have helped clean up homes and businesses in our hometown for over 30 years. We know how to properly clean and restore all properties, and we have performed residential and commercial restoration in Dallas, Lewisville, Frisco, Garland, McKinney, Allen, Ennis, and Plano, TX. We also have a Texas Mold Remediation Contractor License and offer free mold inspections in all DFW. You can trust us to handle all your residential and commercial restoration and cleaning services. SERVPRO of Richardson has been a trusted leader in Texas disaster restoration since 1986. We have restored thousands of homes and businesses. Mold can be disruptive to a business. If you find mold on your commercial property, it’s important to get it remediated quickly to avoid disrupting your business any further. The longer mold is allowed to fester, the more the mold will grow and cause damage to your building. The best time to remediate mold is as soon as you find it. If mold grows larger than 25 square contiguous square feet, then Texas state mold protocol becomes mandated. The time for mold that has to be cleared by the state is longer, which causes a bigger disruption to business operations. Businesses that need mold remediation have important factors to consider when choosing a mold remediation company. Business disruption is expensive and has to be minimized as much as possible. We understand how important it is for the disruption of the mold remediation project to either be minimized or eliminated altogether. We have successfully completed many commercial mold remediation projects by simply scheduling our work after business hours. We’re willing to work with you to find the best time for your mold remediation project. If your business is a 24 hour operation like us, we will work to find ways to minimize the interruption of the mold clean up as much as possible. We can usually accomplish this by using mold containment. Containment means we will isolate the mold affected area so the spores will not be allowed to spread to other areas of your property. This is especially important if your employees begin to experience mold symptoms or you have customers that need to enter your property. Our mold technicians will set up floor to ceiling containment and run HEPA air scrubbers if needed. Containment can be set up immediately; we do not have to wait for Texas state approval. While we are happy to set up containment to help prevent mold growth, it is only a temporary solution as we make arrangements and get state approval for complete mold remediation. Texas has mold laws that begin when mold has grown over 25 contiguous square feet. Mold that is smaller than that still needs to be remediated, but it does not have to be filed with Texas. If your mold is over 25 contiguous feet, then it mold falls under Texas Mold Assessment And Remediation Rules (TMARR). TMARR requires a Texas Licensed Mold Assessor to write a Mold Protocol. Since we are a mold contractor, we cannot legally choose an assessor for you. For a list of licensed mold assessment companies in Texas, please see the Texas Department of Licensing & Regulation. After you’ve received a mold protocol from a mold assessor, a Texas Licensed Mold Contractor (us) will file a Work Plan with the State of Texas. Once the Work Plan is filed, mold law mandates that we wait at least five (5) business days before starting your mold remediation. Our company will work with you to schedule your mold remediation as soon as the mandatory waiting period is over. When we finish the mold remediation, the Mold Assessor has to check the cleaning to make sure it’s successful. If it is, they will issue a Clearance Document. The Texas Licensed Mold contractor (us) can then issue a Certificate of Mold Damage Remediation to you which documents that the mold cleanup was done successfully. Keep this document as part of your permanent records. It may come in handy if you should sell your property or have questions about the mold remediation from your insurance provider. Mold grows on surfaces of moist objects. If left to grow long enough, the mold will eventually damage the object it has been resting on. We have seen mold eat into wood, drywall, carpet, clothing, and even rubber and leather shoes. The longer mold is allowed to fester, the more it has a chance of growing. Mold is a spore that is very small and light. When there is air movement near the mold, the spore will float into the air. When the airborne spore lands, it will have a chance to attach itself to a new surface and continue growing. The problem here is obvious -- the more mold there is, the higher the chance there is for spores to go airborne and infest another area of your property. This is why it’s so important to control mold growth as soon as it is found. To learn more about mold growth, read our article How Does Mold Grow? Our franchise has a Mold Remediation Contractor license with the state of Texas, and we offer no cost mold inspections to all properties in Dallas Fort Worth. If you are not sure whether you have mold or not, that’s okay. Give us a call to schedule your mold inspection, and we will be able to help. You can also inspect your property for mold yourself. Follow our mold inspection recommendations. Kitchens. Inspect for mold around sinks, behind the dishwasher, and behind any refrigerators, ice makers, and coolers. Break rooms. Look for mold behind vending machines with a cooling component and behind water fountains. Bathrooms. Look for mold under sinks and around toilets. Laundry area. Look around every machine that uses water. Around water heaters. If your water heater(s) are in an enclosed space, keep a closer eye on them. Enclosed, dark spaces that have any moisture introduced in them will create an excellent environment for mold growth. Around windows. Look to see if the window’s moisture barriers are still intact. If you see any moisture inside the building, dry the area and fix the window’s barriers. Around doors. Look after a rainstorm to see if any water has permeated. Any other part of your property that previously experienced water damage. Mold has the potential to impact your health and the health of your employees. For a list of health related mold symptoms, please read Mold Allergy from the Mayo Clinic. 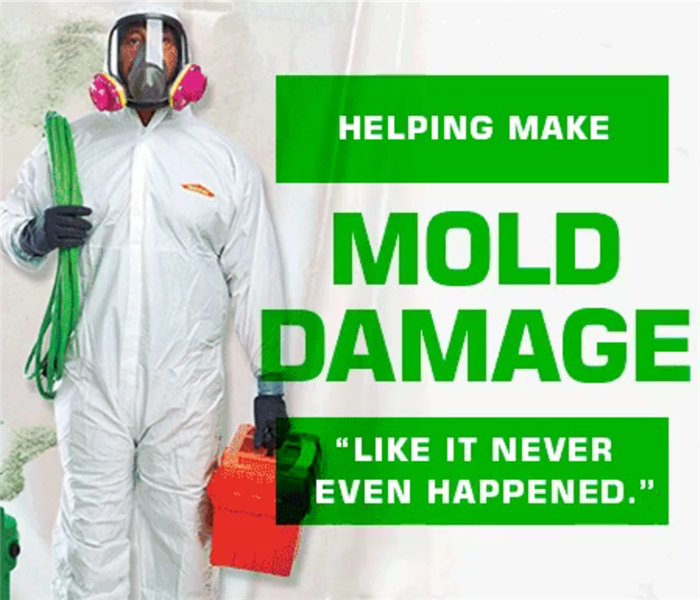 SERVPRO of Richardson is a trusted leader in the Texas disaster restoration industry and has the expertise to handle mold remediation in Dallas and all of North Texas. We are based out of Dallas, TX, and we have helped clean up homes and businesses in our hometown for over 30 years. We have performed residential and commercial restoration in Dallas, Garland, Denton, Grapevine, Ennis, Waxahachie, and other North Texas communities. We have a Texas Mold Remediation Contractor License and offer free mold inspections in all DFW. You can trust us to handle your commercial restoration and cleaning mold needs. SERVPRO of Richardson is a trusted leader in the fire and water restoration industry. We've serviced DFW since 1986. SERVPRO of Richardson is a leader in the restoration industry. We are based out of Dallas, TX, and we have helped restore communities in our home of North Texas for over 30 years. We have performed restoration services in Dallas, Grapevine, Frisco, Plano, McKinney, and other North Texas communities for over 30 years. With our crews responding immediately to jobs, we are faster to any size disaster. We also have a Texas Mold Remediation Contractor License and offer free mold inspections. SERVPRO of Richardson has restored thousands of homes and businesses in Dallas Fort Worth since 1986. SERVPRO of Richardson was started in 1986 by the Weaver family. We bought our franchise from Ted and Doris Isaacson, the founders of SERVPRO. Ted and Doris would occasionally visit our office in Dallas and talk to us about their vision for the future of SERVPRO. Back then, Ted knew what direction he wanted to take the company, but none of us had any idea that the company would become the largest restoration provider in the United States. In the ’80s, SERVPRO was mainly a carpet cleaning company. We opened our first office in south Irving, Texas. It was a tiny workspace, but it provided us with all we needed. After all, when we started, we had just a couple of pieces of equipment, one van, and some detergents. We didn’t need that much space at all! Back then, two owners were the only employees our company had. The idea was for one person to stay in the office and take care of the phones and administrative work while the other went to the homes that asked us to clean their carpets. For a few years, this is exactly what we did. There was just a handful of franchise owners in Dallas at the time. One of our favorites photos is the one we have listed here. 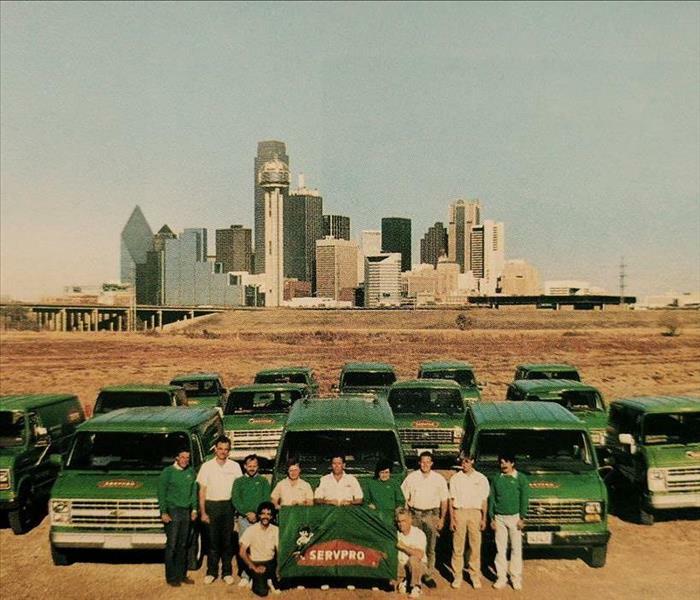 This shows all the Dallas SERVPRO franchises from almost three decades ago. If we were to recreate this photo today, you can imagine that the downtown Dallas landscape would look very different. All the SERVPRO owners and vehicles of today also wouldn’t fit in the pictures! As the years passed and Dallas grew, so did we. After carpet cleaning, we decided to expand our business services to include Dallas fire damage and water damage restoration. Back then, restoration services were relatively unknown. Whenever a home or business was flooded, people would usually tear everything out and rebuild it with new items. This meant that for water damages almost always turned into construction projects where families had to endure the lengthy and expensive process of removing floors and walls and having them rebuilt again. This process took a long time and was very expensive for everyone involved -- homeowners and insurance agencies alike. Restoration services are now the preferred method when handling water and fire damages, and SERVPRO has been a leader in developing the standards that today are widely accepted. The reason restoration is preferred over replacement is simple. With restoration, we clean and save as many items as possible. This process is faster, less expensive, creates less waste, and saves valuable items in a home that people are usually emotionally attached to. Decades ago, we knew that restoration was going to change the property damage industry, and we wanted to be leaders in the Texas disaster restoration industry from the start. As insurance agencies have studied the effect of restoration companies on the industry, they’ve discovered that the best way to restore a home after the damage is to hire the least amount of vendors. This means that when a family is going through the process of rebuilding their home, they show the most satisfaction when they have to work with the least amount of people. The reasoning behind this is logical and easy to understand. Property damage is never pleasant. Accidents still happen and have to be dealt with, and homeowners have an easier time navigating through the cleanup process when they are talking to the least amount of people to get the project done. The least amount of people involved, the less they have to keep track of and, usually, the faster a project can move because those few people can better coordinate their schedules. When our family understood this, we immediately had the goal to be the restoration provider that provided this for a homeowner. We wanted to be the only company that someone needed when they experienced any kind of damage to their property. In other words, we wanted to become a full-service restoration company. This goal required a lot of reinvestment and growth on our end. We needed to learn more than just carpet cleaning and water damage. It was no longer enough to walk into a home, extract water, dry it, and clean their carpets. We needed to learn smoke and fire science, mold remediation, biohazard cleanup, textile cleaning, air duct and AC cleaning, and much more. It has taken decades of learning, training, investment, and finding dedicated and fearless individuals in Dallas Fort Worth to make our vision come true. The second generation of Weaver family members that have spent their entire life growing up hearing about SERVPRO on a daily basis and learning about restoration is now running our franchise. And, just like we grew up around our office, our own children -- the third generation -- is experiencing the same we did. The SERVPRO franchise community is special because many franchises are family owned and operated. Many franchises in Dallas were started by a family and today their kids that grew up around the franchise are running it. While we all share the SERVPRO name and green and orange colors, our businesses are unique. When someone hires a SERVPRO franchise, they are hiring generations of a family to work with them. Because SERVPRO of Richardson is family owned and run, we take everything that happens personally. We celebrate the successes and take opportunities for growth seriously. Our employees are our extended family. Just like a family, our group shares the good days and the bad. Working in the restoration industry isn’t always easy. We meet people that are going through a difficult time every day, and we know--many times from personal experience--the pain and stress they are going through. We have been asked to restore properties that have seen Dallas flooding, fires, trauma and unattended death, and crime scenes. We have restored entire neighborhoods affected by Dallas storm damage like major wind, hail, and tornadoes. Our drive and dedication have been well worth with. We have restored thousands of homes and businesses in our hometown of Dallas in over three decades. Just as importantly, we’ve also achieved our goal. Today, we are one of the few full-service Dallas restoration company. Over the years, many other water restoration companies have started and tried to replicate the success that SERVPRO has. None have been as successful as we are. SERVPRO has the most franchises, the most technicians, and the furthest reach of anyone. We have the capability of handling a job anywhere in the United States as a moment’s notice, and we can handle jobs as small as a one-room water damage to a building with hundreds of thousands of square feet. We have traveled to every kind of natural disaster and helped to rebuild entire communities. Our speed and depth of service cannot be matched. SERVPRO of Richardson is a trusted leader in the restoration industry. We are based out of Dallas, TX, and we have helped clean up homes and businesses in our hometown for over 30 years. We know how to properly clean and restore all properties, and we have performed residential and commercial restoration in Dallas, Garland, Richardson, Plano, McKinney, and Grapevine. We also have a Texas Mold Remediation Contractor License and offer free mold inspections in all DFW. You can trust us to handle all your residential and commercial restoration and cleaning services. SERVPRO of Richardson is a trusted leader in fire damage restoration. We have serviced our home of Dallas Fort Worth since 1986. Boards up are needed on an emergency basis and are usually one of the first things that happen in fire damage. After the fire department leaves, a property is sometimes left with damaged doors and windows. These open spaces create two problems. First, damaged entryways allow the weather to enter the property. If rain, snow, or just natural moisture enter the property and wet items, the property is setting itself up for both water damage and mold growth. This type of damage is considered secondary damage, which an insurance company will not typically cover if it can prove that a property owner could have taken steps to prevent it but didn’t. It’s important to seal entryways with weatherproof barriers to prevent both secondary damages to your property and to help your fire damage insurance claim be wholly covered. Secondary, damaged entryways make it easier for thieves to enter your property. It’s unfortunate but common for robberies to occur in fire damaged properties. Even though many items inside have been damaged, thieves typically ransack the home looking for anything valuable. Boarding up doors and windows both make it harder for thieves to enter, and the barriers send a clear message that the property is being taken care of. When the weather prevents our office from immediately boarding up a property, we will hire a live security offer to monitor your property. To learn more about our emergency board up services, please read our article. Another part of a property that typically needs immediate attention is the roof. We will install a temporary roof tarp to all damaged portions of your roof to prevent any precipitation from entering the property and causing secondary damage. Secondary damage to your property from a leaking roof can include water damage which then leads to mold growth. The roof tarp is meant to be a temporary security and safety measure. After the tarp has been secured, our office will send your insurance company an estimate to permanently fix or replace your damaged roof. See our pictures of previous roof tarping jobs. An ultra low volume fogger is specialized equipment that we use when deodorizing a home or business after fire damage. The fogger vaporizes solvent-based deodorizers and creates what looks like smoke. This “smoke” is made up of very small particles that will reach the tiny crevices that a person cannot otherwise clean with traditional methods. The use of ULV foggers has risks and should only be used by professionals with training and experience. Ozone is used for fire damage deodorization. Items that have been wiped of soot but still retain smoke odor are typically sent to our specialized ozone room. Items that are being treated with ozone remain in the ozone room until the smoke odor has been eliminated. Just like ULV foggers, ozone should only be used by a trained professional. Our office uses commercial air duct cleaners to clear residential and commercial air duct vents of all soot. Smoke contains very small particles of the substance that was just burnt. When a fire occurs, the properties of smoke say that the smoke will first travel to places in a property where the temperature is cooler. Oftentimes, this means that the air ducts in that property will become full of smoke. When the smoke cools, it settles into the air ducts and becomes soot. When we inspect a property for fire damage, one of the first places we will inspect is the air duct system. If it needs to be cleaned, it’ll be one of the first things that is taken care of in our fire damage restoration process. The last thing a homeowner needs is to have their entire home cleaned only to turn on their air conditioner and have fresh soot blow throughout their home! Our air duct cleaners are commercial grade and clean air ducts of all sizes. Visit our air duct cleaning page to learn more. A typical carpet cleaner will just not be powerful enough to get a smoke and soot affected carpet clean again. A typical carpet cleaner that you can purchase at an electronics store or rent from a grocery store do a decent job with day to day wear, but smoke and soot permeate the fibers of a carpet and require a deeper clean. In our SERVPRO production vehicles, we have specialized and commercial truck mounts that help us extract water after flooding. These truck mounts also have the ability to deep clean carpets. SERVPRO has developed a carpet cleaning method for fire and smoke that involves hot water extraction and specialized shampoos. Our cleaning has been refined after decades of research and is an effective cleaning method for fire damaged carpets. Fire damage cleanup is rarely as straightforward as many people think. Our technicians use specialized sponges that are specifically made to capture the fine soot particles that embed themselves into walls and furniture. Before applying any chemicals to clean surfaces, we will first wipe the entire surface with fire damage cleaning sponge to remove as much soot as possible. An ultrasonic machine is a sophisticated piece of equipment that we often use in fire damage clean up. An ultrasonic machine looks like a very large tub that is filled with water and proprietary chemicals made to remove soot from items. Items that need to be cleaned are loaded into the machine and dipped into the water. The water itself looks like billions of tiny bubbles are swimming inside of it. The bubbles are caused by high frequency, low amplitude vibrations. Items remain in the ultrasonic bath until all the smoke and soot particles are removed from the item. This process usually takes no more than a few minutes. After the items have been cleaned, they are removed from the ultrasonic machine and transferred into a specialized drying chamber. After items are dry, they are packed and stored for the homeowner. The Esporta Wash System is the most effective way to sanitize clothing and other textiles after fire damage. Soot is acidic, which makes it damaging to clothing once it touches it. The longer soot is allowed to remain on a piece of clothing, the higher the chance that is will permanently stain it. Clothing is also a necessity for everyone, and one of the first things a family needs after fire damage is fresh clothing to wear. For these reasons, we work to quickly pack up all clothing and textiles from a home and take it back to our fire damage cleaning facility for processing. An Esporta machine looks like a large front loading washing machine, but inside of it are chambers where we load clothing. Once the machine is running, the chambers of clothing spin rapidly inside the machine which forces the detergent-laden water to push all smoke and soot particles out of the clothing. A typical Esporta wash lasts well over an hour with a variety of six different detergents used. Esporta proprietary chemicals are environmentally friendly and result in clothing having a near neutral pH after a wash.
We introduce different cleaning agents to each load we wash until the item of clothing is food grade clean, meaning it is safe to wear again. The Esporta Wash System is safe for almost every type of clothing and textile, including shoes, stuffed animals, and leather. After a wash, the clothing is transported to a specialized drying chamber. We are one of the few businesses in Texas licensed by the Esporta Wash System. We have successfully restored thousands of pieces of clothing and textiles. Our restoration rate is over 85% -- one of the highest in the industry. Learn more about the Esporta Wash System in our article Esporta Cleaning for Clothing and Textiles. SERVPRO has developed many chemicals that help us properly clean after fire damage. We have perfected the use of our own proprietary chemicals after decades of research of experience. SERVPRO of Richardson is locally owned and operated leader in the restoration industry. We have the expertise to handle any size smoke and fire damage restoration in Dallas, TX. We have performed residential and commercial restoration work in Dallas, Plano, Garland, McKinney, Allen, and other North Texas communities for over 30 years. We also have a Texas Mold Remediation Contractor License and offer free mold inspections. SERVPRO of Richardson is a disaster restoration company based in Dallas, TX. 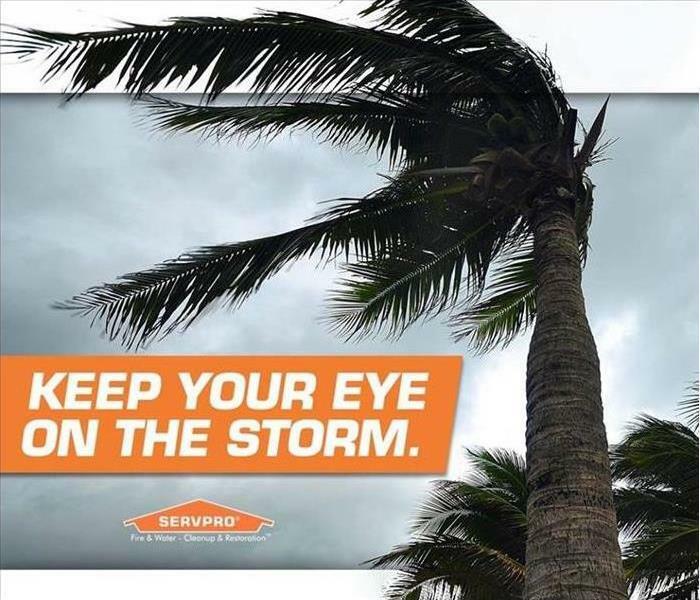 When a community is impacted by a hurricane, SERVPRO is quick to respond. Our company has access to over 1,700 franchises nationwide, and our storm response teams have decades of experience. Hurricane Harvey was emotionally impactful for our franchise and all of Texas. The hurricane hit the Houston and Galveston areas in Texas in 2017. Thousands of homes were impacted, and the damaged cost well over $100 billion. Days before Hurricane Harvey hit, franchises nationwide were already preparing to deploy to Houston metro and Southwest Texas. For our franchise in Dallas, our preparation was two-fold. Our first concern was to receive our friends and family members from Houston. When it became apparent that Harvey was going to hit as a major category storm and evacuations were going to be suggested, we needed to make sure our loved ones would be safe. Members of our team prepared their homes to receive guests all the while preparing themselves to dispatch to the storm itself. We understood that we would be traveling to both help strangers and our loved ones as well. For friends and family that chose not to evacuate, we made agreements to meet them at their homes to make sure their properties were safe. The second part of our preparation was to study the meteorological reports. Understanding the category of hurricane helps us prepare for the amount of damage we expect to see. We take into the consideration the community that is impacted, how much water has fallen, how quickly its fallen, and wind conditions. All these factors tell us the amount of damage a typical home will have, which then tells us what tools and equipment we need to take to best respond to those that call us for help. When our franchise is considering how to prepare for a hurricane, we take various aspects of the storm into consideration. One of them is the Saffir-Simpson Hurricane Wind Scale. Dangerous winds are associated with Cat 1 hurricanes. During these storms, we expect to see damage to a home’s roof, gutters, and vinyl siding. We also expect to see some tree damage, especially branches falling atop of unshielded vehicled or falling onto homes. In this case, our franchise prepares expects to see some water damage and a large need for roof tarping. The winds in a Cat 2 hurricane are around 100 mph and will cause more damage than before. Even well-constructed homes have a large possibility of getting major damage to its roof and siding. We also expect to see trees uprooted and block roadways. Power outages are also extremely common. In this scenario, our franchise will take a large load of roof tarping materials and power tools to assist with debris removal for roadways that are blocked on the ways to homes in need. We also expect the need for our own power generators. A category 3 hurricane is considered to be a major hurricane. In a Cat 3 hurricane scenario, we expect to see major damage or even the removal of the roof decking. We also expect to see trees and branches uprooted and either block roadways or damage homes themselves as they fall. Electricity and water outage will likely be a factor. In this case, our franchise responds similarly as we do to Cat 2 hurricanes, which is by taking roof tarping materials, power tools to clear debris, and carrying our own generators. Due to the amount of fallen water associated with this category of hurricane, we also expect to not have immediate access to flooded areas of the community. If this is the case, we will wait for approval from first responders before proceeding. In a Cat 4 hurricane, we expect to see homes lose some or all of their roof and have damage to their exterior walls. Many trees, even those deeply rooted, will be snapped and often fall onto homes, vehicles, and block roadways. It’s not uncommon to see many homes cut off from emergency services due to debris. With the loss of electrical power and water plus the flooding and blocked roadways, the areas impacted with a category 4 hurricane may not be accessed for days or even weeks. In this scenarios, our crews are first helping the outer areas and assisting homes that are accessible as we wait for first responders to reach these areas and deem them accessible. Due to the time it takes the water to recede, our franchise expects major damage to homes and businesses. Flooring and a major portion of the walls in these properties will need demolition. Sanitation will be a major concern, and mold growth may already be present. Roof tarping and board up services will almost always be necessary to secure the property. In a Cat 5 hurricane situation, we expect to see many homes and businesses experience a roof collapse and damage to the exterior walls. Sections of a community will be flooded and not be accessible for weeks. Uprooted trees will also damage properties and block roadways. Our response to this category of damage is the same as in a category 4 with our franchise understanding that it will take a longer time for the flood waters to recede and first responders to allow restoration service workers to enter. Storm surge threat is not as easily scalable as wind scales due to local conditions such as bathymetry. 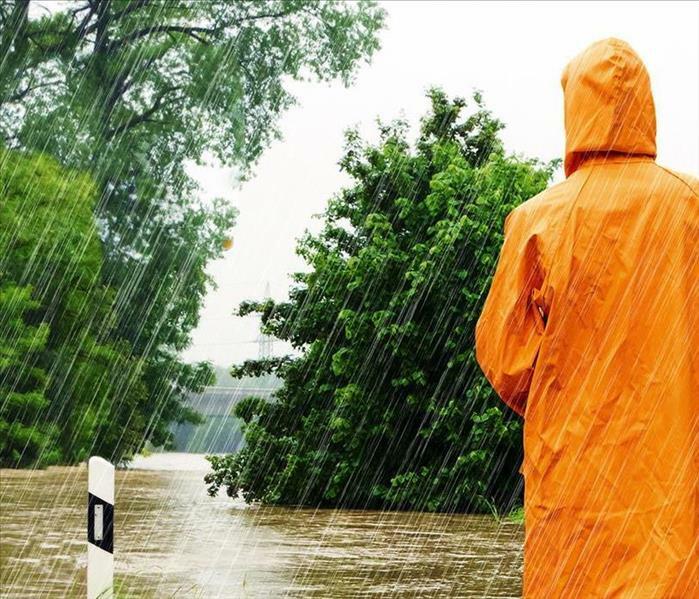 For this reason, our franchise pays close attention to meteorological reports that focus on the depth of inundation expected at the impacted areas. These storm surge warnings greatly help us know how to approach properties and prepare demolition, sanitation, and drying techniques. Depending on the time it takes for the waters to recede will also tell us how much, if any, of the contents inside a home or business will have a chance to be restored. This helps us know if debris removal will be necessary, and if mold remediation needs are likely. 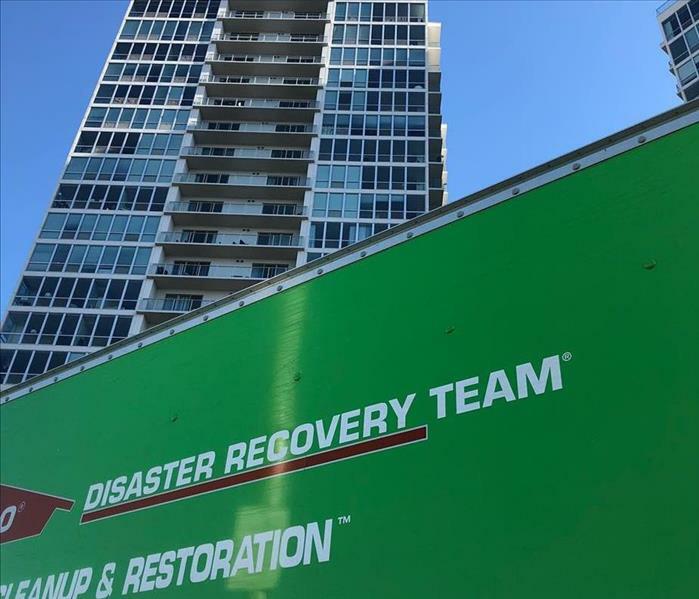 When a storm is strong enough to call for evacuations, it’s often bewildering to see the green SERVPRO trucks head towards the storm when some are leaving. Our franchise has studied the storm and is heading to the closest but still safe destination. Our choice of lodging is either a hotel or another SERVPRO franchise location that is safe from the storm. Wherever we are able to stay, our crews will set up a command center, dispatch, and sleep. During Hurricane Harvey, we had both options ready. We set up a command center as close as possible to the open impacted section and began to help homes in that area. As first responders allowed more areas of the Houston metro to be open, we relocated closer to the city. Eventually, we traveled to other parts of Texas that were calling for help and were not receiving the saturation of help they needed. These areas included communities in Southwest Texas. Hurricane Harvey was a devastating storm. SERVPRO franchises nationwide responded to Harvey and spent months in the Houston metro and Southwest Texas regions responding to calls. For our franchise, we were thankful that no one of our friends and family was injured by the storm. While some of their properties had only minor damage, others needed more extensive restoration and reconstruction needs. By many accounts, Hurricane Harvey tested the resolve and preparation of Texas disaster restoration teams. We were personally humbled by the outpouring of support shown for impacted residents from the thousands of volunteers from across the nation that traveled to south and east Texas ready to help. We saw volunteers from almost every state come together and assist homeowners, and we were thankful for them. Texas Strong became a rallying cry that we will not soon forget. Now, over a year after Hurricane Harvey hit, portions of Texas are still rebuilding. To learn more about the Rebuild Texas Fund, please visit: https://www.rebuildtx.org. SERVPRO of Richardson is a leader in the restoration industry and has the expertise to handle storm damage cleanup. We are based out of Dallas, TX, and we have helped restore communities in our home of North Texas for over 30 years. Our franchise has traveled to disaster locations such as Hurricane Katrina and Hurricane Harvey. We have performed restoration services in Dallas, Arlington, Garland, Plano, Waxahachie, Midlothian, and other North Texas communities for over 30 years. With our crews responding immediately to jobs, we are faster to any size disaster. We also have a Texas Mold Remediation Contractor License and offer free mold inspections. Read more about our storm damage services. SERVPRO of Richardson is a trusted leader in Texas disaster restoration. We have restored thousands of homes and businesses since 1986. When they received an alert about a severe storm warning in her area, Derek and Marilyn made sure they were prepared. They brought the car into the garage, gave their dog a break outside, and then went back inside to start preparing dinner. The surprise came when the storm continued for almost a week. Soon, the streets of began to flood. The water was coming out of the toilet and the bathtub. The unpleasant smell was just one of the problems. There was no way to stop the backup. The rain was still pouring outside and it was spreading to the entire house. It was in two bedrooms, all the bathrooms, the kitchen, and the laundry room. SERVPRO of Richardson received Marilyn’s call at about 3:30 in the morning. Our on-call manager, Jessica, took in Marilyn’s information. During a storm, our franchise activates its Storm Protocol. Everyone in our office is well aware of storm and traffic conditions, and we prepare ourselves to work overtime in order to reach all the families and businesses asking us for our help. It’s not a situation we see often. In the case of Derek and Marilyn’s home, the days of heavy rain had filled their town’s drains and was causing the water in their own home’s drains to be pushed back into their property. “We realized that unless the city took care of the drain issue on their end, our house was just going to keep backing up with sewage. With the storm still happening, the city was busy fixing other flooding problems around town and they were not going to be able to get to us for a few days. It was a nightmare,” Marilyn continued. The situation captured the attention of our entire management team. Leaving a home with a recurring sewage backup wasn’t an option, so we came up with a plan to help our Derek and Marilyn while their city was able to fix the drains. “SERVPRO came twice a day until the city got their end fixed,” Derek explained. “Every time they came, they took out all the water and sanitized everything it had touched. They kept in touch with us to see how we were doing every day." Marylin said, “They also prepared for the house with the water damage in mind. They elevated our furniture so it wouldn’t get touched by the water, and they moved everything off the floor that could be damaged." Our franchise is one of the few water restoration companies in North Texas that is Esporta Wash System certified. We have the unique ability to take clothing and other textiles affected by sewage, smoke and soot, and mold sanitize them to be food grade safe. We have cleaned thousands of pieces of clothing, and our restoration rate is one of the highest in the industry at over 85%. We understand that when clothing is affected, time is of the essence. We can pick up, process, and drop off 100 pounds of clothing in as little as 48 hours to help you have enough of your wardrobe to be okay while the rest of your claim is processed. Many homeowners are concerned when they file a homeowner’s insurance claim. We have a team of administrators that are experienced in handling the claim’s process for all insurance companies. Call your insurance company and let them know about your situation. Tell them SERVPRO of Richardson is the restoration company you’ve chosen to handle your cleanup. By law, your insurance company must honor your choice of restoration company. When they give you a claim number, call our office and let us know what it is. The administrator from our office that is assigned to guide you through your restoration project will then contact your adjuster and work with them to process your claim. “The person from SERVPRO that has walked me through this is Jessica. She’s kept in touch and let me know what’s going on with our claims process. I really haven’t had to worry about anything.” Marilyn said. After Derek and Marilyn’s water damage was resolved, it was time to handle the reconstruction needs of their home. The sewage water had permanently damaged their flooring and kitchen and bathroom cabinetry. 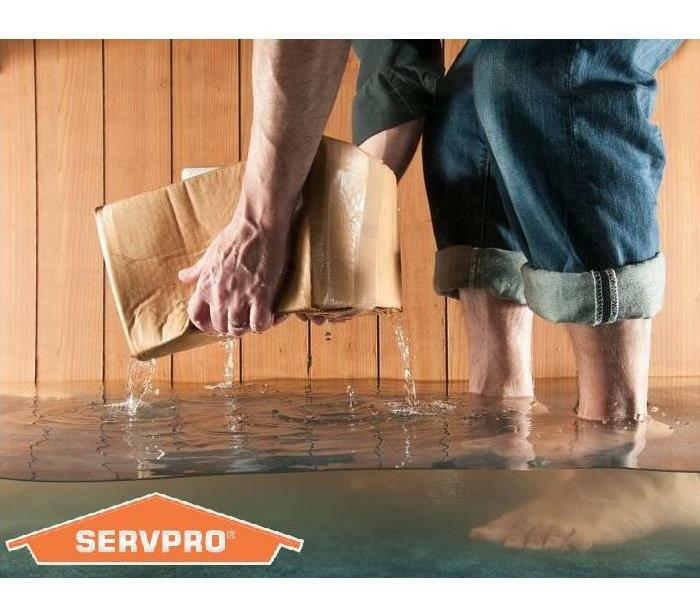 SERVPRO of Richardson is a full-service restoration business, which means we can take care of water damage from beginning to end. When a property has been cleaned and dried of all water, our reconstruction team will work with you to replace anything that was damaged as a result of the water. We handle all documentation and processing your insurance adjuster needs to make sure this portion of your claim is also covered. If you find yourself in need of help during a storm, we’re here for you. Our franchise has been servicing our home of North Texas for over 30 years, and we have the experience you need to get your property taken care of the right way. SERVPRO of Richardson is a leader in the restoration industry and has the expertise to handle storm damage cleanup company in Dallas, TX. We have helped restore communities in our home of North Texas for over 30 years, and our franchise has also traveled to disaster locations such as Hurricane Katrina and Hurricane Harvey. We have performed restoration services in Dallas, Garland, Plano, McKinney, Midlothian, and other North Texas communities for over 30 years. With our crews responding immediately to jobs, we are faster to any size disaster. We also have a Texas Mold Remediation Contractor License and offer free mold inspections. You can trust us to handle your restoration needs. We are family owned and operated. Learn more about us.